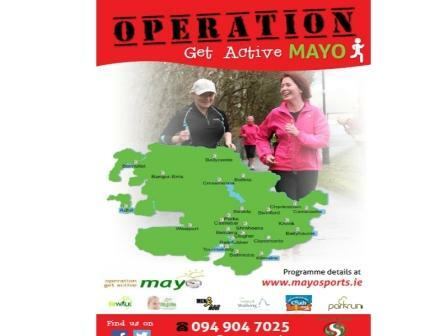 25 areas across Mayo participating in "Operation Get Active Mayo"
Following the huge success of the National Operation Transformation Walks last Saturday the Operation Get Active Mayo Campaign is now fully underway. Programmes and activities are taking place in 25 areas across the county catering for people of all ages and abilities and everybody is invited to "Get Active". While communities are coming together for a specific 5 week long Operation Transformation Programme there are a lot of other programmes taking place which target beginners to physical activity. These programmes include Men on the Move ( beginner programme which targets men aged 30 plus for physical activity), Couch to 5K (beginner 8 week programme to bring people from walking to jogging a 5K), Fit Walk (5 week indoor fitness walking programme), Meet and Train / Fit4Life ( caters for people who jog, run and is suited to all abilities), parkrun (weekly free timed 5K walks / runs), Active 55 for Older People (balance / coordination exercise programme and games follwed by cup of tea/ coffee). All these programmes can be downloaded in the directory file which is given below. "The response has been fantastic. People will be able to join activities in any of the 25 locations in Mayo, all that may be required is to contact any of the co-ordinator numbers given in the directory of programmes" stated Mayo Sports PartnershipCo-ordinator Charlie Lambert. ‌In a‌ssisting groups with their 5 week programme Mayo Sports Partnership have developed some information resources on lifestyle, exercise, diet / nutrition etc and also some posters st that communities can advertise their campaign locally. Also available is a 21 day walking challenge card which people can use to record and monitor their progress during the campaign. The 5 week programme will culminate with 5K Fun Run / Walk in each of the 5 locations in Ballina, Belmullet, Castlebar, Claremorris and Westport on Saturday 21st February.